Our Mission: The mission of Crown Pointe Academy is to promote creativity, curiosity, character, and community in a challenging Core Knowledge environment. We hope that everyone had a great weekend! Big FISH Night is coming up this Friday, January 18th from 5:30-8:00 p.m. This fun and engaging fitness expo is open to students and families in all grades, and all students must be accompanied by an adult. See the flyer and schedule of events on the CPA website for more information. The CPA-PTA is hosting the Snowball Dance on Friday, January 25th from 6:00-8:30 p.m. Join us for a night of fun with food, music, and dancing! Entrance to the dance is free, and concessions and glow sticks will be available for purchase. If you are interested in volunteering to help with the dance, please sign up by clicking here. See the flyer on the CPA website for more information. The Academy Board approved school calendars for the 2019-2020 and 2020-2021 school years at their meeting last week. Please see this week’s Update (attached) for more information about the calendars, and the approved calendars are available under the Monday Folder documents on the CPA website. As a school, we have recorded 7,182 volunteer hours for the year. Please remember to record all of your volunteer hours and help us reach our volunteering goal of 14,000 hours for the year. Demonstrating strong parental involvement can help CPA qualify for grants and other funding opportunities, so it’s important that every hour is recorded. You can fill out the paper log and return it to the office, or you can record your hours online by sending an email to volunteer@crownpointeacademy.org. Make sure to include your name, your student’s name, and the total hours volunteered for the month in the email. Thank you! 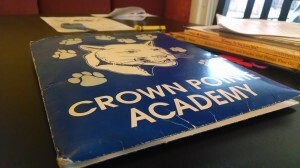 Crown Pointe Academy of Westminster is a tuition-free public Charter School that teaches a Core Knowledge curriculum. We feel that the education of your student is a partnership between the teachers, you the parent, and your child. We strive to give all our students the best education experience. The school has a strong academic orientation, where high achievement by students is valued, encouraged rewarded, and expected. Office Hours: 7:30 a.m to 4:00 p.m.
School Hours: 8:00 a.m. to 3:20 p.m.